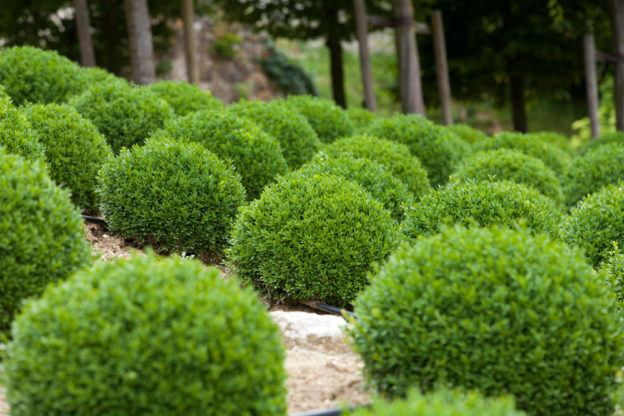 Boxwood are one of the most versatile and elegant of evergreen shrubs. They have very shallow roots, can tolerate most conditions and be used in both formal and informal settings. It are theses characteristics that make them so desirable today. Their popularity is not new. Although grains for a species was found in England as far back as 7,000 B.C., they were destroyed during a Glacial epoch. They resurfaced around 4,000 B.C. in ancient Egyptian tombs. Their popularity surged at the height of the Roman Empire and throughout the Dark Ages, used as hedges and topiaries in Royal gardens. One of the Boxwood’s most delightful and interesting facts is that it has historically been used to make boxes, chess pieces, printing using woodblocks, and musical instruments and parts, particularly form the strings and woodwind class and is still used for many of these purposes today. It is a plant that seems almost too good to be true! Well almost. As of late our dear friend has had some issues, that many of you might have experienced. Several years ago we had an extremely cold Chicago winter with unusually light snow cover…and plants with shallow roots really rely on their winter blankets. As spring sprung, we noticed the loss of a lot of plant species…especially boxwood, yews, junipers and roses. Boxwoods suffered another hit. Boxwood blight. It is a fungal disease that really has no treatment. The only course of action is to remove them from the nursery or landscape. These plants of course need to be replaced, and replace them we are. Why is having to replace them so important to our tale? Well because Boxwoods are extremely slow growing, and as the demand increases due not only to popularity but a need to replace them, growers just cannot keep up. It is a difficult concept to explain to a property owner, but our current reality. There are alternatives. They are not boxwoods, but they are options…”Green Mound’ Alpine Current, ‘Karen’s’ Azalea, Deutzia, and our owner’s favorite… Barberry. Peruse some of these favorites on our nursery’s website. Many people say everything happens for a reason. Maybe this did. I like to think utilizing a different palette challenges our creativity and encourages diversifying our monoculture. This entry was posted in Favorite plant series, ILT Vignocchi, Maintenance, Shrubs and tagged barrington, boxwood, iltvignocchi, landcapers, landscape, landscape architecture, landscape contracting, landscape maintenance, north shore on February 15, 2019 by iltvignocchi. If your property does not have an automated irrigation system and you have not watered your turf regularly this summer, you may have noticed it is turning brown, indicating it is reacting to the impact of the summer drought we are in the midst of here in the northern Chicagoland area. Your grass has a natural drought defense system which shuts down the expendable parts of the plant in an effort to keep its roots alive, hence the brown coloration at the surface. The good news is, turf grasses are resilient plants and can survive a long time without water. The bad news is, not only does the brown grass not look good, the dormant grass will become more susceptible to invasive weeds and crabgrass which tend to find room to root and grow in the stressed turf. Generally, though, once moisture returns, most grasses will recover without leaving permanent damage. The weeds and crabgrass can be treated, and your once beautiful lawn should be restored. The simplest and best practice that we have found for helping the turf survive and recover from the effects of a drought, if regular watering is not an option, is to make some simple adjustments to our mowing operations. We raise our mower blades slightly, to 3″ – 3.5″, to minimize the heat/sun exposure of the root systems of the turf that results from mowing too low in these hot, dry conditions. Additionally, you will find that we will forgo mowing whenever warranted, on a given visit, if the grass has gone dormant and has not grown sufficiently to necessitate a mowing. This will prevent the potential damage that could be done to the dry, brittle grass blades as the heavy mower wheels roll over them. The added benefit of not mowing is the extra time we can spend on your property detailing and performing more labor-intensive gardening operations. Furthermore, the longer grass blades will shade the ground underneath, keeping it cooler and inhibiting water evaporation. The granular fertilizer we apply during your lawn care visits will stimulate new growth once rain returns or the lawn is watered. If you are going to water your lawn, you must be consistent. If you cannot deeply water your lawn one inch or more per week, it is better to let your lawn go into a state of dormancy. Light, infrequent watering can do more harm than good as it encourages shallow root growth which then makes the turf even more susceptible to disease and insect infestations during periods of stress. So, it is best to commit to keep up with the watering or let it go and wait out the drought. When temperatures start to cool down and rainfall increases, your lawn should come out of dormancy and begin to recover. The turf plants will start growing new roots and new plants will germinate to replace those that were damaged or even killed during the summer. Core aeration and over seeding in the fall are two great ways to help your lawn recover from a tough drought season, like the one we are currently experiencing. Strengthening the roots is critical to maintaining healthy turf, and the core aeration process will open the lawn to provide more air, water and nutrients into the turf root zone. Following up the coring operation immediately with over seeding will help to generate new seedlings to fill in sparse areas. Grass seed needs to come in contact with soil and receive adequate moisture to remain viable once the germination process begins. A good portion of the seed will end up in the core holes, which ends up being a great place for the seed to germinate. The soil in the core holes will remain moist and cool, and the seed will have a much better chance of germinating. This entry was posted in Irrigation, Maintenance, Watering and tagged drought, environment, horticulture, ilt, iltvignocchi, irrigation, landscape, landscape ideas, landscapers, landscaping, lawn mowing, maintenance, north shore, watering on August 17, 2018 by iltvignocchi. Most of us love fall, but plants love it even MORE! Most people think of fall as the end of the growing season and the beginning glimpse of another Chicago winter. Well try to look at it as an ideal time to plant! Fall is a perfect time for planting shrubs, trees, grass seed, and even perennials if they have a developed root system. Fall planting gives plants time to develop roots before winter’s blustery conditions. The conditions are also less stressful and there may be more reliable precipitation. What happens during fall conditions is a plant’s leaf and flower production is usually slowing down and approaching dormancy. Therefore, a plant can focus on root production. Roots continue to grow when other parts of the plant are not. Generally speaking, root systems will keep growing as long as the soil temperature is at least 50 degrees. Although we generally get more rain in fall, the good news is that plants use less water then. Because days are increasingly shorter and cooler in the fall, plants are going to be photosynthesizing less and using less water. Fall is also when depleted nurseries can begin to dig plants again, so varieties that were either unavailable or just downright unsightly in July and August, may become available. Finally, don’t forget about BULBS! Its often surprising why more people don’t take advantage of this relatively inexpensive way to welcome in Spring. To achieve a gorgeous Spring show bulbs are planted in late fall. If you’d like to start planning a fall project, it is right around the corner, so call us now and we will be happy to assist you! This entry was posted in Design Build, Fall and tagged design ideas, fall, fall flowers, horticulture, ilt, iltvignocchi, landscape ideas, north shore, perennials, planning, tips, trees on July 20, 2017 by iltvignocchi. I have a deep love of pansies. I adore that they come in every color of the rainbow, which is unusual for an annual flower. It is wonderful that they can be pure, or blotched or multicolored all on the same plant. Have you ever looked at pansies when it is about to storm? Try it, they absolutely glow. What really sets them apart though is how charming cheerful they are. What can be seen as a drawback? They are a cool season plant and in the Midwest we only get to enjoy them in spring and fall. Oh I’ve done the experiments…transplanting them to the coolest shadiest parts of my yard to no avail. They just peter out. I actually like that they only shine twice a year. It makes them all the more special. It is thought that pansies are a close cousins to the viola, which has roots in Greece in the 4th century B.C. However, they believe the first pansies were first found in France, because the word pansy is traced back to the French word pensee, meaning thought or remembrance. Today popularity booms and most innovations are being made in Germany, Japan and the United States. What is interesting is the amount of passion to innovate in this area. It isn’t to create a drought free plant, or even one that is resistant to diseases or animals (which they are NOT). The innovation, is to take something that was beautiful to begin with and make it even more so. I for one am glad they are. This entry was posted in Annual Flowers and tagged annual flowers, cool season plants, design ideas, fall flowers, flower history, horticulture, ilt, iltvignocchi, landscape, landscape ideas, maintenance, north shore, pansies, Pansy, planning, spring flowers, tips on April 21, 2017 by iltvignocchi. Growing plants on rooftops is not a new concept. Centuries ago northern Scandinavians harvested sod from their surrounding landscape and placed it upon structures to create effective insulating and water resistant roof systems. The Vikings who explored the upper Atlantic built grass-covered homes where they settled and in Iceland sod roofs and walls have been used for hundreds of years. Although the living roof or green roof has been in use for a long time, modern green roof technology has helped to elevate this building method from a crudely effective construction element to an aesthetically pleasing, ecologically responsible building solution for age-old building problems and current environmental concerns. A green roof or living roof is a roof of a building or other structure that is partially or completely covered with vegetation and a growing medium, planted over a waterproofing membrane. It may also include additional layers such as a root barrier and drainage and irrigation systems. Green roofs can be very basic, known as extensive green roofs that incorporate drought-tolerant, self-seeding native ground covers such as sedums, grasses, mosses and prairie flowers that require little or no irrigation, fertilization or maintenance. These green roofs are lightweight, inexpensive, and can be retrofitted onto existing buildings, often without significant alterations or additional structural support. Intensive green roofs are more elaborate roof gardens designed for human interaction. They generally have a relatively flat roof surface or mild slope and allow for a larger selection of plants, including shrubs and trees and require specific engineering to be able to conform to the weight load requirements. Storm-water runoff will be greatly decreased with the utilization of a living roof. The growing medium and the vegetation of a green roof retain large amounts of storm water and release it back into the environment. A typical green roof can absorb 30% of the rainwater that falls on it, reducing the amount of water that goes through our waste water systems. It is a common misassumption that a green roof system will have a deleterious effect on the integrity of the roof system. Quite the opposite. A well designed, correctly installed green roof will protect the waterproof membrane that lies beneath it and, in turn, will extend the overall life of a roof. Recent studies indicate an increase in life span of almost double. Green roofs absorb carbon dioxide that contributes to global warming; and the slow transpiration of water back into the air creates a cooling effect that helps reduce the heat retention and emanation in and around your building. In addition to the energy saving features described above, the actual mass and density of a living roof will provide excellent sound insulation for a building as well. And let’s not forget the aesthetic benefits of the rooftop garden. The roof garden intermingles the pre-construction environment with the built environment creating a sustainable cooperation between development and nature. People love to interact in the relative secluded natural setting created by the intensive garden on a rooftop space. Additionally, they benefit emotionally and psychologically from the ability to even look upon the greenery of an intensive or an extensive roof top garden. Green roof technology was re-invented in Germany in the mid-20th century and quickly spread throughout Europe mainly due to its restorative environmental impact. Today, Chicago has been a leader in green roof installations with up to 7 million square feet on approximately 500 rooftops; the most of any city in the United States. The benefits of the green roof have not been ignored by suburban businesses and multi-family residential buildings either. Corporations, commercial building owners, and homeowners associations are looking for solutions to increase employee well-being, decrease their carbon footprints, increase their LEEDS scores, and differentiate their properties from their competition. The rooftop garden has proven to be just such a solution. Reach out to ILT Vignocchi today to inquire about the potential for your headquarters, office building, clubhouse, or other structure to benefit from a green roof installation. This entry was posted in Design Build, ILT Vignocchi, Perennials, Sustainability and tagged commercial buildings, construction, design build, design ideas, glenview, horticulture, ilt, iltvignocchi, landscape, landscape ideas, net zero water, north shore, planning, sustainability, tips on April 12, 2017 by iltvignocchi. Chicago may break 134 year old record! In Case You Were Wondering…if this current snow drought that we are in sets a record for longest period between snow events of 1” or more, read on. Chicago’s official snowfall records began with the winter of 1884-85. Over these 134 years, Chicago’s longest spell without a snowfall of at least 1 inch occurred twice: 64 days from Dec. 3-Feb. 4, 1905-06, and Dec. 23-Feb. 24, 1953-54. On Dec. 17, Chicago recorded 1.7 inches of snow, the city’s most recent snowfall of at least 1 inch. As of Feb. 16, that would be 61 days ago. Our streak must persist for at least one more week to have a chance at setting the record. Lest you think that my interest in snow seems self-serving (after all I am one of the managers of the best snow removal company in Illinois), there are important benefits from regular winter snowfall that we all share. The most obvious is the moisture. The following equation varies based on the density of the snow which is determined by the temperature, but generally, every ten inches of snowfall melts into the equivalent of one inch of rain. Chicago has received, on average, about 36” of snow annually over the last three decades, which translates into 3.6 inches of equivalent rainfall or about 10% of our annual rainfall total. Granted, much of our snow melts and runs off in the spring, but the snow cover prevents evaporation during the winter, conserving soil moisture. Plus not all the snow melt runs off, further adding to soil moisture for the upcoming growing season. Another major benefit of a good snow cover is that snow functions as an excellent insulator of the soil. Without snow, very cold temperatures can freeze the soil deeper and deeper. This could lead to damage to the root systems of trees and shrubs. The insulation effect of snow also helps protect perennials, bulbs, ground covers, and other shallow rooted plantings from alternating freezing and thawing cycles. Without snow, milder temperatures and the sun could warm the soil surface, leading to damage from soil heaving, which can break roots and dry out plant parts. And, lastly, snow is aesthetically pleasing. A snow-less winter in Chicagoland is drab, dreary, and gray. Snow brightens everything, bringing out the colors and textures of evergreens, ornamental grasses, and tree and shrub bark. Snow cover just makes a Chicago winter more complete. This entry was posted in Snow and tagged chicago snowfall, commercial buildings, HOA, ilt, iltvignocchi, landscapers, maintenance, north shore, record breaking, snow, tips on February 16, 2017 by iltvignocchi. Best of Houzz Award winner! Wauconda, IL January 13, 2015 – ILT Vignocchi has been awarded “Best Of Houzz” for Customer Satisfaction by Houzz, the leading platform for home remodeling and design. The 46 year old landscape architecture and contracting firm was chosen by the more than 25 million monthly unique users that comprise the Houzz community from among more than 500,000 active home building, remodeling and design industry professionals. This entry was posted in Awards, ILT Vignocchi and tagged awards, houzz, ilt, iltvignocchi, landscape, landscapers, north shore on January 19, 2015 by iltvignocchi. Personally I love Houzz. I should say that my husband loves it even more! He is constantly browsing their easy to navigate site for high quality, stylish ideas for both his customers and our own home improvement ideas. It is not only a must for people considering home renovations, additions or new construction. It is FUN experience for those of us who love design and love to ponder “dream” situations in our own homes. ILT Vignocchi is pleased to contribute photos and content so consumers can tap into our ideas and use them in their Ideabooks. We are also grateful to have customers who are fans enough of our services that they rave about us on Houzz. If you haven’t played around with this super exciting website…the largest home renovation website in the WORLD, get to it! Like I said. It is FUN. And don’t we all need a little more fun? This entry was posted in Design Build, ILT Vignocchi, Uncategorized, What's New at ILT Vignocchi and tagged design build, design ideas, houzz, ilt, iltvignocchi, landscape, landscape ideas, landscapers, north shore, planning, tips on December 18, 2014 by iltvignocchi. Finishing up a landscape walkway, steps, patio and pergola in Lake Bluff, Illinois. This entry was posted in Design Build, ILT Vignocchi, Patios and tagged bluestone, construction, design build, hardsurface, ilt, iltvignocchi, north shore, patios on December 5, 2014 by iltvignocchi.